PIZZA TEEN! : Chimpy Cheeta Update! Gosh, that was fast! 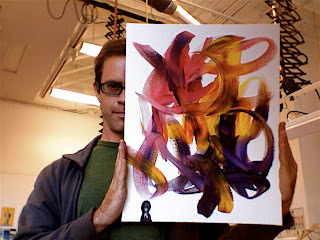 As you might remember from this post, the first painting I ever commissioned (from a human or otherwise) arrived in the mail just a moment ago. It has far exceeded my expectations. That monkey can paint! Spectacular! It's even better than a lot of stuff created by all those Yale grads currently on exhibit in Chelsea.